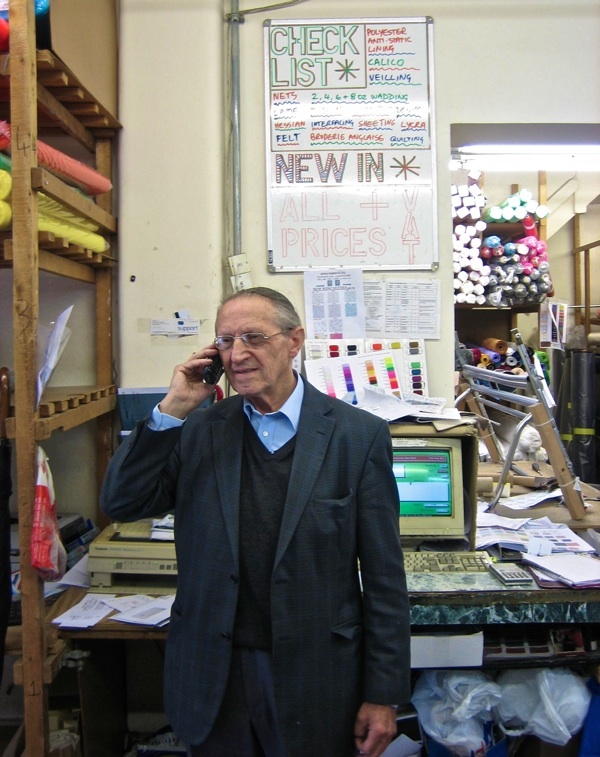 While his son Daniel was in Israel organising Leo’s grandson’s wedding, Leo was running the shop single-handedly, yet he managed – with the ease and grace of his fifty-five years experience – to maintain the following monologue whilst serving a string of customers, cutting bolts of fabric, answering the endless phone calls and arranging a taxi to collect an order of ten rolls of velvet. “I started in 1956, when I got married. 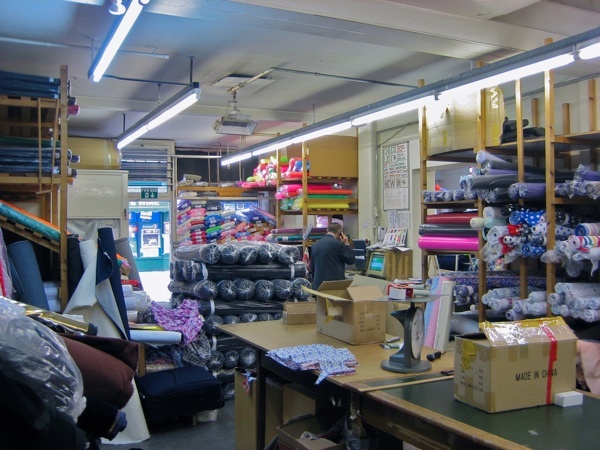 I used to work for a company of fabric wholesalers and one of our customers on Brick Lane said, “There’s a shop to let on the corner, why don’t you take it?” The rent was £6.50 a week and I used to lie awake at night thinking, “Where am I going to find it?” You could live on £10 a week then. My partner was Rajchman and initially we couldn’t decide which name should come first, combining the first two letters of our names, but then we realised that “Raep” Fabrics was not a good trade name and so we became “Epra” Fabrics. In no time, we expanded and moved to this place where we are today. In those days, it was the thing to go into, the fabric trade – the City was a closed shop to Jewish people. My father thought that anything to do with rebuilding would be a good trade for me after the war and so I studied Structural Engineering but all the other students were rich children of developers. They drove around in new cars while I was the poor student who could barely afford my bus fare. So I said to my father, “I’m not going to do this.” And the openings were in the shmutter trade, I didn’t ever see myself working in an office. And I’ve always been happy, I like the business. I like the social part. In just a few years, the first Indians came to the area, it’s always been a changing neighbourhood.The first to come were the Sikhs in their turbans, and each group that came brought their trades with them. The Sikhs were the first to print electronic circuits and they had contacts in the Far East, they brought the first calculators. And then came the Pakistanis, the brought the leather trade with them. And the Bengalis came and they were much poorer than the others. They came on their own, as single men, at first. The head of the family, the father would come to earn the money to send for the rest of the family. And since they didn’t have women with them, they opened up canteens to feed themselves and then it became trendy for City gents to come and eat curry here and that was the origin of the curry restaurants that fill Brick Lane today. 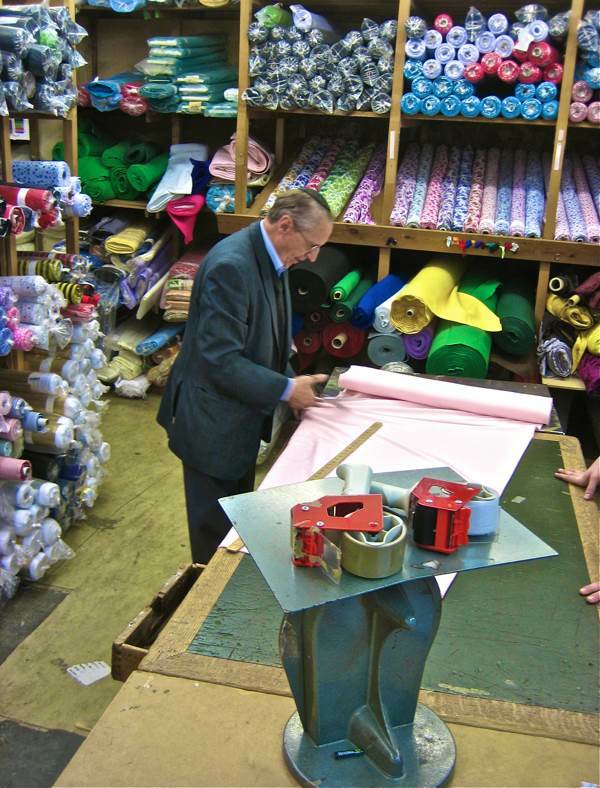 At any time over the last half a century, you could have walked up Fashion St, crossed Brick Lane and entered Epra Fabrics where you would have been greeted by Leo, saying “Good morning! May I help you?‘ with respect and civility, just as he does today. After all these years, it is no exaggeration when he says, “Everyone knows me as Leo.” A tall yet slight man, always formally dressed with a kippa, he hovers at the cash desk, standing sentinel with a view through the door and West along Fashion St to the towers of the City. 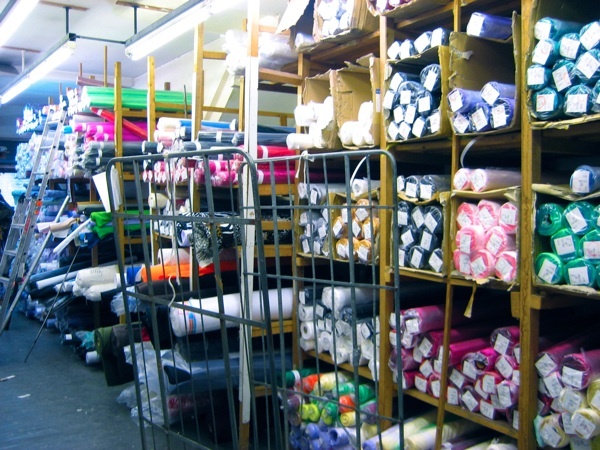 Here you will find an unrivalled selection of silks and satins. “This is Brick Lane not Park Lane,” is one of Leo’s favourite sayings, indicating that nothing costs more than a couple of pounds a metre. “We only like to take care of the ladies,” is another, indicating the nature of the stock, which is strong in dress fabrics. “Many of the Asian shop owners come in from time to time and say,‘Oh good, you’re still here! Why don’t you come and have a meal on us?‘ You can’t exist if you don’t get on with everybody else. It was, in a way, a weirdly pleasant time to see how everyone pulled together.” he concludes dryly, revealing how shared experiences brought him solidarity with his neighbours. Leo Epstein is the last working representative of the time when Brick Lane and Wentworth St was a Jewish ghetto and the heart of the shmutter trade, but he also exemplifies the best of the egalitarian spirit that exists in Brick Lane today, defining it as a place where different peoples co-exist peacefully. As someone who spent most of his working life in the “shmutter” trade may I congratulate you on staying the course. What a lovely write-up! I feel very honoured and proud of you being my Uncle Leo. The shop has changed a lot since I was last there, but the photographs bring back happy memories of mucking around in the shop on a Sunday morning and feeling very grown up when you let me use the measuring machine. I was always nervous to go down in the basement, it was very dark and scary. You always gave us money to go to the sweet shop a couple of doors down and somehow we always ended up in Blooms! May you enjoy being an “ambassador” in Brick Lane for many many more happy years to come. Thank you for such a lovely essay, GA. I have just been to see Leo at his shop on the strength of this post and to my delight he provided me with six metres of blue velvet (that I’d been trying to find for ages) at an excellent price and was charming, gracious and funny. It’s a privilege to be able to shop locally and know you are buying a little piece of history as well as some fabric. always make you feel welcome, whether you are buying a little or a lot. Read the article with interest, we always stop for a curry a curry after shopping. Well Done Leo, very inspiring storey! Firstly mazaltov on the bar mitzvah. Of the shop, how it still looks the same. For others to follow your example. This is a very touching article. I wish I had experienced the same response that reflects the description above as the shop has such a variety of beautiful fabrics. One Sunday I went into the shop and waited for some assistance. In the meantime I overheard Leo selling a piece of fabric to a lady. I wanted to buy the same fabric at the same amount. Leo insisted I misheard and bumped up the price. Regardless of that, I liked the shop so I continued to look around. 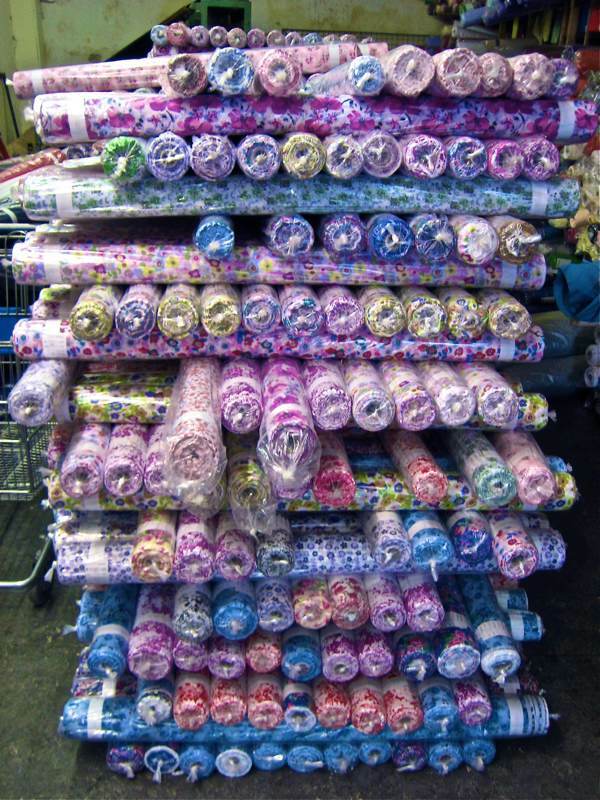 Leo became extremely irritated and bumped up the price further to £5.00 per meter cotton from the original £1.95. And refused to serve me unless I spent £30.00 or more, otherwise “get out”. Another customer overheard this conservation and was extremely shocked with Leo’s service, so we both left. Speaking to the community of Brick Lane, this rude service is the current and true reflection of Epra. Many customers have left the store extremely upset from the way Leo has spoken to people. I notice Epra do not let you write reviews on google anymore. There are only decent ones from 2011. Unfortunately it has changed since 2011. It’s a massive shame.